With such quality services comes significant financial obligations. 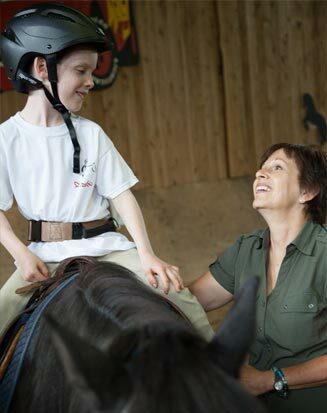 Despite the strong interest in the medical community for therapeutic riding, no government assistance is available at this time. The daily care of the horses, including food, accounts for more than $100,000 a year, while costs charged to parents correspond to only 50% of the actual operational expenses of the centre. Éric Ziegler for his involvement in the Défi Banque Scotia. Pierre-Benoît Forget and René Brisebois and his team for the organization of the winter fundraising dinner. Ron Viens and Diana Berto and her team for the organization of the fall fundraising dinner. Me Pierre J. Deslauriers, Habitation Euphoria, BBB Foundation, Lyne Francœur, Fondation Martin-Matte and the Semmelhaack family for their horse sponsorship. MacKay Foundation, Fondation Fournier-Éthier, BBB Foundation, Fondation Martin-Matte, Club Lions de Sainte-Thérèse, CIBC Children’s Foundation, Fonds Dynamique, Zeller Family Foundation, Ms Susan Shaw, DentsuBos and Graphiques M&H for donations and support.